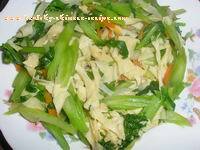 Stir fried celery with dried tofu strips is quick, easy and healthy vegetarian recipe. Celery flavor combines with delicate dried tofu flavor. It's light, suitable for summer or as a refresh dish in holiday. 1. Clean dried tofu, cut into thin strips. Clean celery, cut into strips in slant. 2. Heat oil in a wok, add seasoning A. Sway the wok till fragrance comes out. 3. Add dried tofu strips, stir fry. Add hot water, stir fry till the dried tofu becomes tender. 4. Add celery strips, stir fry several times. 5. Add sauce A, stir fry and mix well. 6. Turn off heat, pour in a plate. Serving Method: Serve with rice, noodle, steamed bun or bread. Tips: Dried tofu is dry and hard, so we should cook it tender first by adding some hot water.